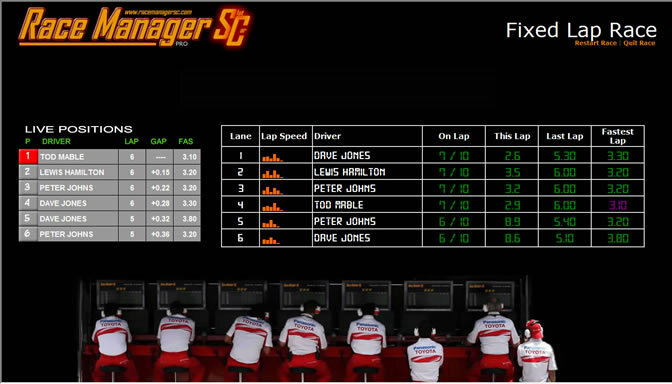 Race Manager is a Formula 1 style telematory system for slot cars that has sold many copies throughout the World. Keeping track of lap times, track positions and race and championship stats are just a few of the things it can do when connectd to a slot car racing track. Go online and Race Manager understands this and allows the user to upload to a central server their race results and stats which are then displayed to all other Race Manager users so that International competitions could be run. You may not want us to build you some race software. Instead you may want a new accounts package, sales and marketting software, time tracker or perhaps even something completely different.